Over the weekend I released Version 0.6 of my @simplecast plugin, Simplecast Episodes. Aside from some smaller internal changes, I added what I think is a pretty nice feature to coincide with WordPress 3.9’s new feature to create media playlists from audio and video: the ability to download episodes directly into WordPress, adding them to the media library. The way it works right now, there are two different methods. The first is a button to go through and download all previously added episodes. This will go through all of the Simplecast Episode post types in WordPress, grab the download link, and pull the audio file into the Media Library. This is still a beta feature but give it a go and let me know what you think! In my tests, on my localhost it took a while, but on my live site (tilpodcast.co), the downloads happened surprising quickly. One note: You should only do this once. In a future build (perhaps very soon), I’m probably going to either hide that button after it’s been done or programmatically check to make sure each file only gets downloaded once. The other feature added is the ability to automatically download an episode when it’s posted. This was added to the rest of the plugin settings and is by default set to “No.” When set to “Yes,” the audio file will be downloaded when you click the “Publish” or “Save” button. This will only happen once, so you don’t have to worry about multiple downloads if you make updates. 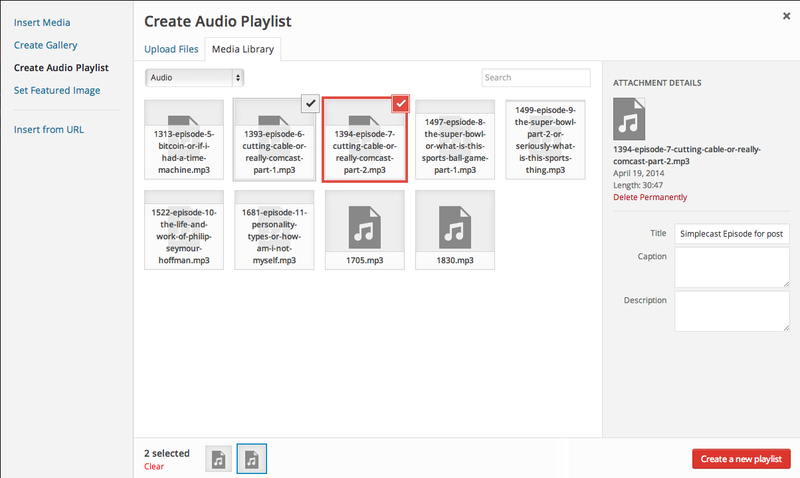 In WordPress 3.9, They added the ability to create playlists using the Media Uploader. Using these new features in Simplecast Episodes, creating playlists will be a breeze! Clean up the code and do some refactoring. Explore the possibility of pulling show notes from Simplecast. Head on over to the official page in the WordPress Plugin Directory to download it, rate it, and leave feedback!